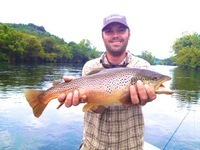 I grew up bait fishing all over Arkansas, so I was excited when my buddy Dom bought the fly shop in Norfork, AR. 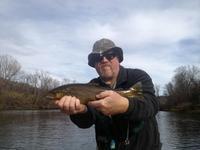 I quickly booked a trip and on our way to the put in I noticed we only had fly rods. He said "trust me!" I caught a cutthroat, a big brown, and more rainbows than I can count on my first trip. 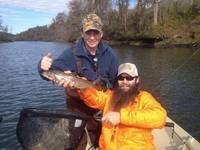 I was immediatley in love with fly fishing and have been back several times since. Dom is an excellent guide and quite a character. I totally recommend Two Rivers Fly Shop! What a day we had! Dominic put us on the fish ! If you need a guide he's the man. Anthony Santoro and I fly fish once a year during our annual trip to Arkansas and Dom made us look good, catching well over 30 fish each. 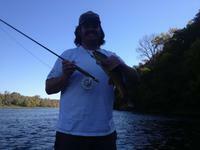 More importantly, he's a real nice guy unpretentious and laid back something not often found in a pro fishing guide. Made us northerners feel welcome in the Ozarks. Thanks to Joe Fennel for making it happen. You rock Dom! Having made acquaintance with Dominic through a mutual friend on Facebook, I was intrigued with the numerous pictures he was posting of his daily excursions on the Fork. It was all the prompting I needed to plan a trip to awesomeness that is Arkansas. I called my brother-in-law in Rolla and told him we needed to head down and see if this was for real. I picked him up and we drove through pea soup thick fog the night before anticipating a day full broadsided browns and hard fighting rainbows. To make a long story short, nothing my mind could imagine matched the day we spent with Dom. A full day float ususally consists of two drifts from the dam to the take out on high water. We were into so many fish on the first pass, having to drop anchor to land them, that it would have been impossible to do a second run and be off the river before nightfall. My brother-in-law and I, all the way back to Missouri, were just awestruck at the experience we had that day on the river. I am not a big "guide using" kind of fisherman (and sometimes pay the price with the subsequent learning curve) but the experience I had that day was worth every single cent. Thanks for a great day that neither I or my brother-in-law will ever forget. Dominic is an old school guide that knows every inch of water, rows like a beast and flips out when you stick a good fish. He lets you do your thing, but he's not afraid to point out where you can improve. He's just there to make sure you have the best day on the water possible. Add that to the amazing fishery that he guides on and it makes for a pretty amazing day. It was one of the best days of fishing I've ever had. Thanks again for an amazing trip man. I'm still daydreaming about it.